Google, a search engine with the biggest database in the world, has a game made after it. 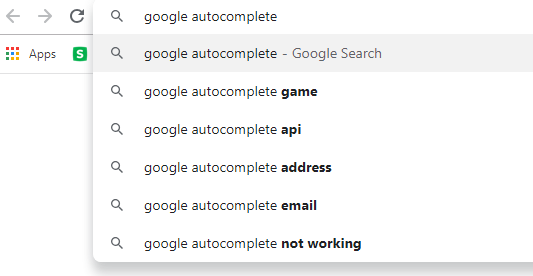 This search engine has a predictor function called “autocomplete” where the database attempts to figure you what you are looking for based of algorithms of billions of searches. 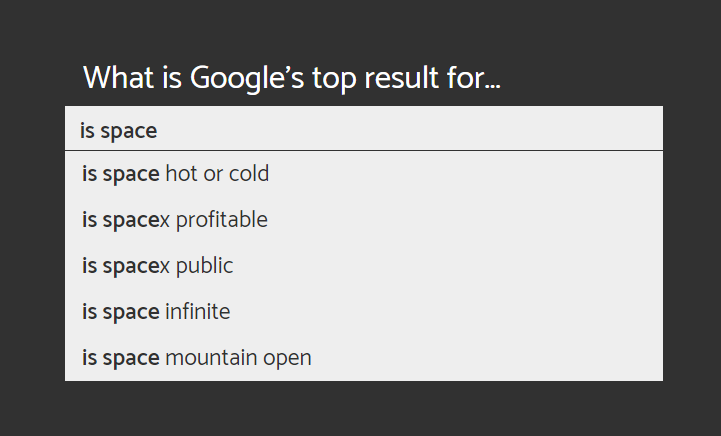 The end result is that the most popular searches end up at the top of the prediction list. This also works as a handy SEO (search engine optimization technique if you want to see popular things that the world is looking for on Google. There’s a game based on this? I had to check this out to see how this worked. I got this one right; the answer was “Is space infinite” because I figured that’s what various people around the world from different cultures would want to know. 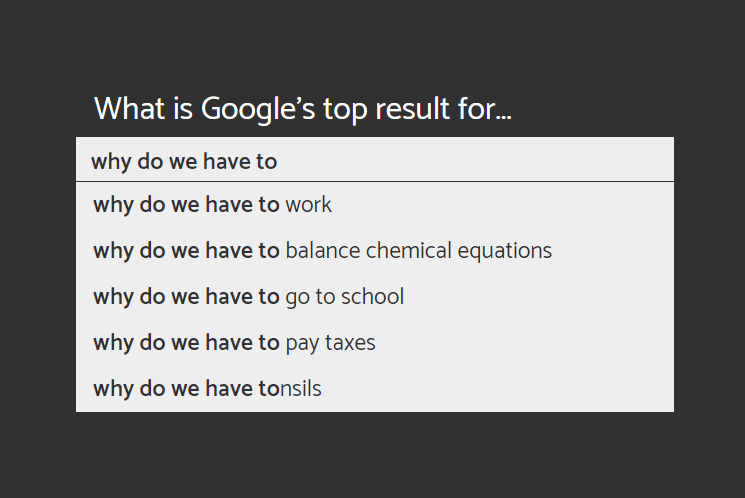 OK… I was not expecting an autocomplete that was incomplete with just a dangling letter and not a whole concept. 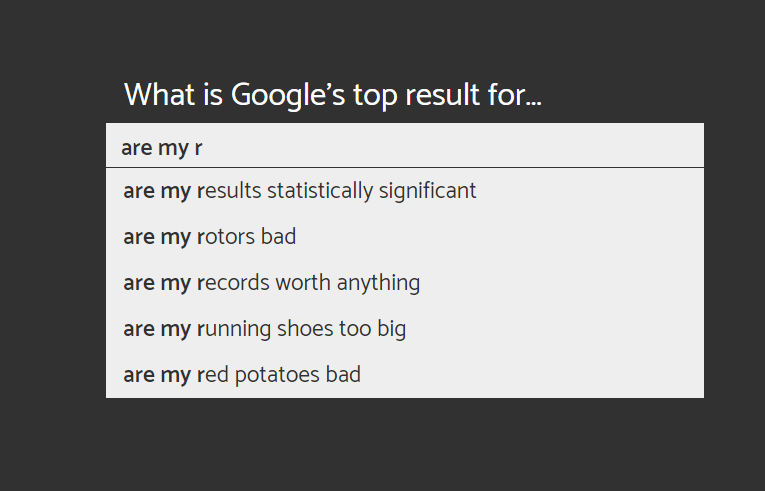 So I tried to figure out what searchers of the internet would look for and I thought that people would want to know if their running shoes were too big for safety and health reasons. Got it right again! Too slow to capture the screen. Will try to get the next one. This is the first one that I got wrong, but I presumed if you were on the internet, that people would search for free money for college. 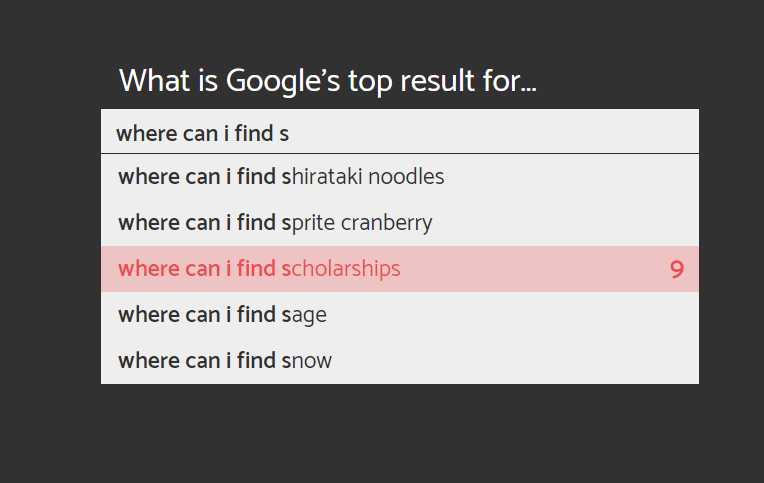 But it’s ranked number 9th most popular search for “where can I find s.” OK, no problem. It’s got to be snow, right? Hmmm… number 5. 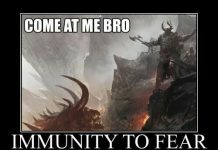 So… maybe there’s a lot of spiritualists and possibly sage? And there it is. 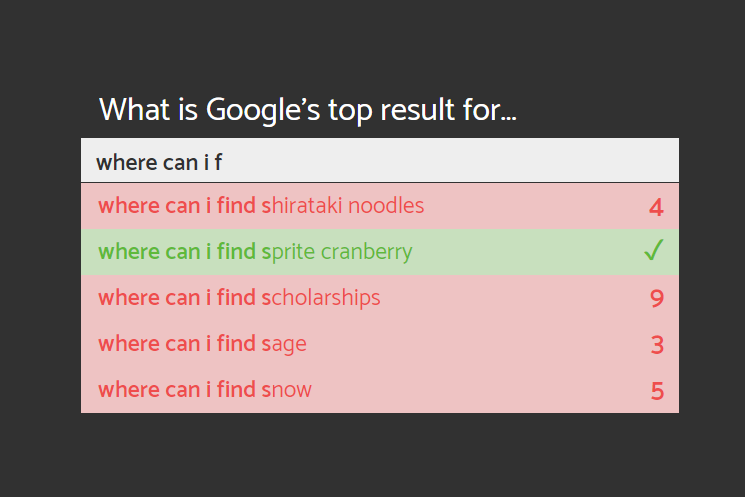 This did make me look up Sprite cranberry in the real Google search and I’m going to have to try this one day. Next one should be easier. Alright. 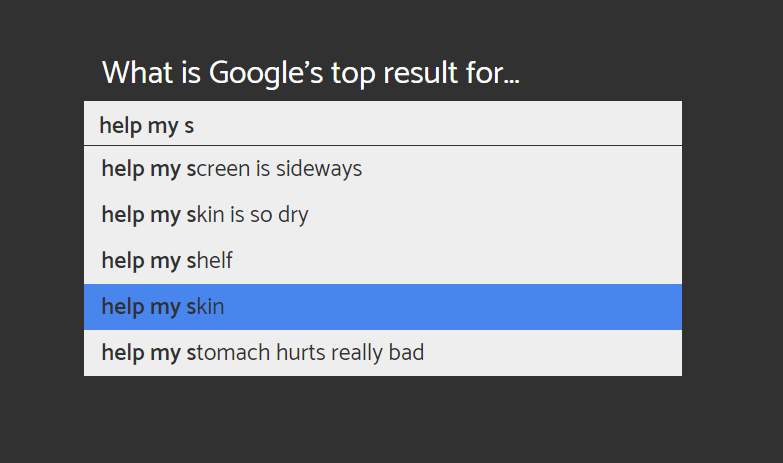 I think people are going to choose “help my skin” because I’m thinking people might want to identify skin problems on the internet. 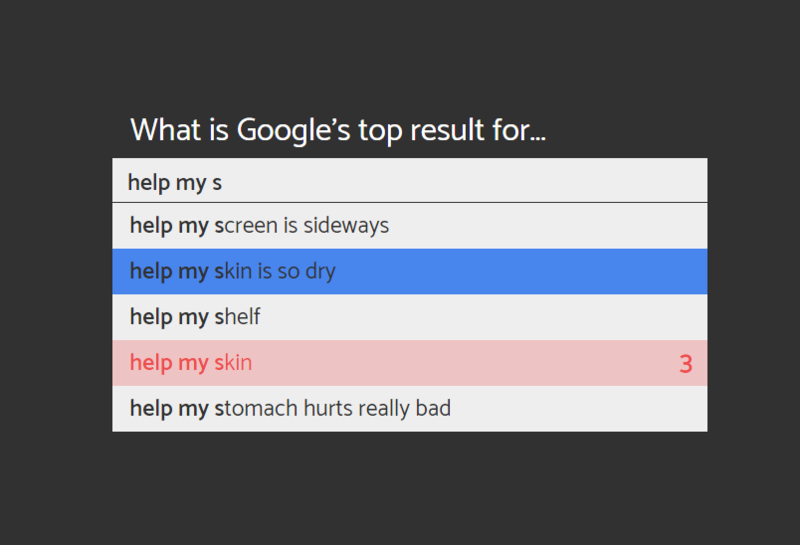 But I saw “help my screen is sideways” and realized that this is most likely going to be a common people are going to look up in Google more readily than their stomach. It turned out to be correct. THIS question. 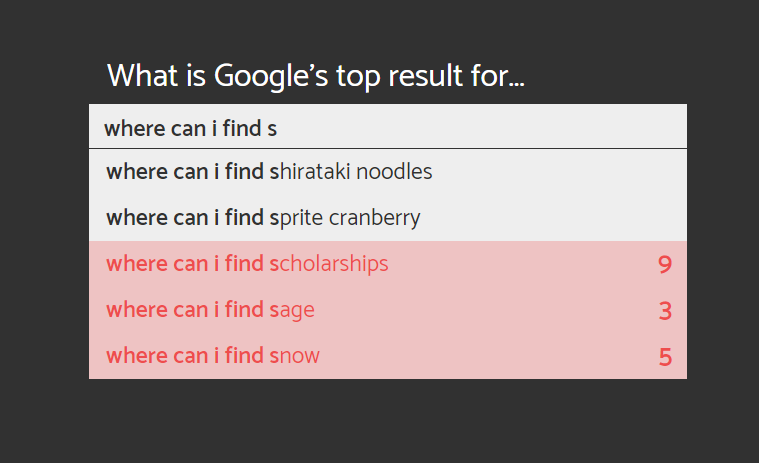 This one actually looks hard because most of these are legitimate questions and searches and ANY of them can be correct. I figured it was going to be taxes since people want to know about that subject, but that wasn’t correct. Then I figured maybe many of the younger generations will want to know why school is compulsory and so I selected that one. That wasn’t correct either. Then I thought that maybe people will want to know why people have to work. And that was also incorrect. In my brain, this made absolutely no sense. 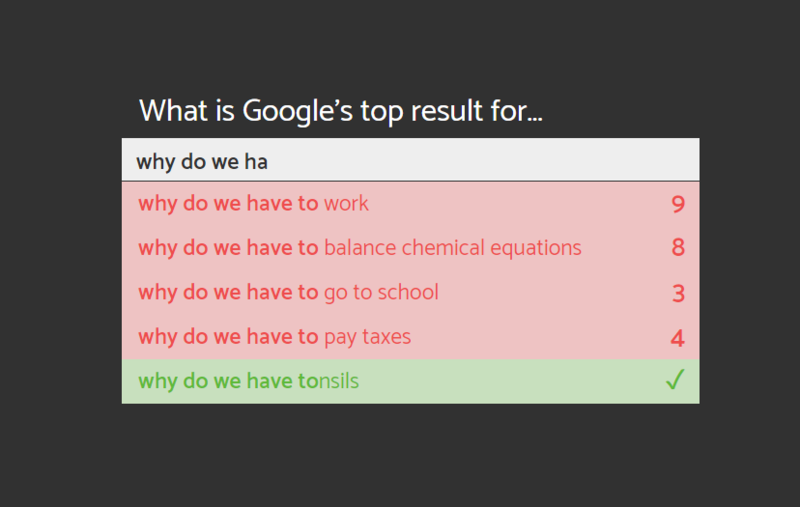 While I understand that people will look up random facts, I didn’t think tonsils applied more to general life than work, school and taxes. 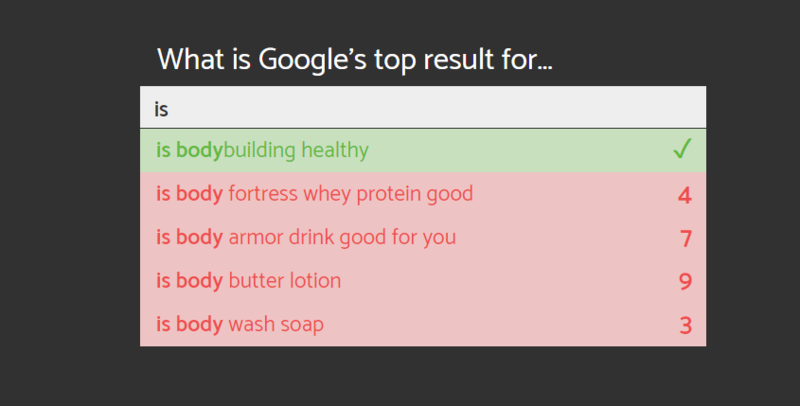 But again, this game is created off of real results from Google. By the way, this game was NOT created by Google, but was created by a programmer that goes by the name of Lemon @AhoyLemon on Twitter. There is a tally at the top of the screen showing the record of how well or far off you are in your guessing history. The first two questions, I guessed right on the first try. But to give you an idea of how bad “bad” was, it meant that I had to guess wrong three times before I got it right on the fourth try. This game is not as instinctive as it looks. But it is fun to play. Then you get questions like this. 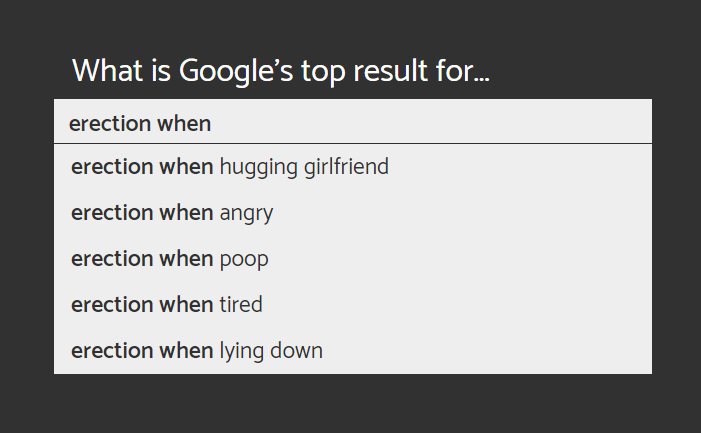 Let’s just say that I did not get it right the first time and I had to consider that the internet has collective experiences in these searches to warrant that they would be ranked by Google. Not going to spoil this for you if you ever manage to play this game. This is the third question that I got right on the first try. 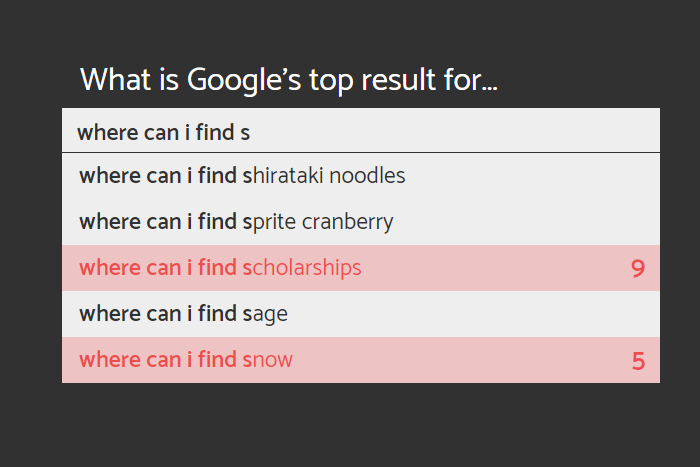 It is neat that the results show where everything else ranks once you answer the question correctly. And I think we’re done here once I answered three questions, otherwise I would keep playing because this is a pretty addictive game on the internet. 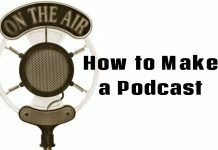 A very simple, but somewhat educational time waster that is worth checking out. A little disappointed that I only got 25% of the questions right on the first try, but maybe you’ll do better than I did. Not kidding. That IS the web address for this game. 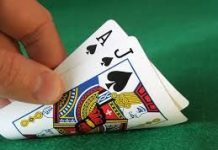 For more games that you can play, especially on your smartphone, check out this post on the “20 of the most fun games on your smartphone,” which I wrote based on extensive game playing and killing time on my iphone.